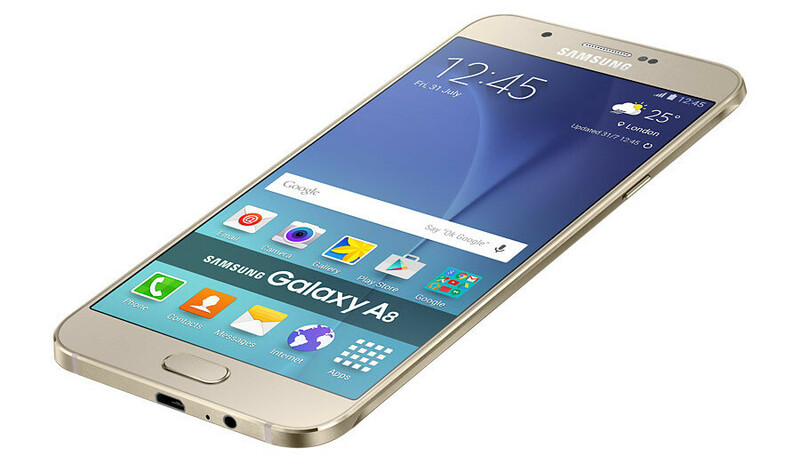 The Galaxy A8 is the newest addition to Samsung's A series of thin, light and good-looking affordable Android phones. The largest one in the series, the Galaxy A8 features a 5.7" display, all in a body measuring just 5.9mm thick, with a sleek metallic profile. Its slim size dictates a smaller than average battery pack, and the Galaxy A8 features a 3050mAh cell. Hidden behind the non-removable back cover, you can't easily swap the battery, so it's even more important for the phone to do well in terms of battery longevity. Official Galaxy A8 battery stand-by time stands at the below average 12.7 days (304 hours), but in order to fully understand the capabilities of its battery, we had to test it ourselves. Our custom battery test is performed with the display calibrated at 200 nits (keep in mind that for AMOLED screens brightness changes depending on the content, the 200 nit value applies to measurements of an all-white background). Then, we run a custom script specifically made to simulate typical smartphone use and loads. So how does the Galaxy A8 battery does in our test? Not too bad at all: with a score of 8 hours and 49 minutes (this is the time the phone lasts with the script running non-stop, with the screen always on), the A8 does better than the majority of its rivals, but still fails to reach the very best battery performers. In real life, our impressions are that the phone will easily last a full day even under heavier use. It typically takes us around a day and a half until we need to recharge the phone. The Ultra Power Saving Mode that we know from early 2014 is also on board, so you can switch it on and have a crippled smartphone experience with a black-and-white, but also one that will last you for hours on single digit battery percentage and allow you to take and make a call when you need that. Finally, when it comes to recharging, the Galaxy A8 lacks quick charging and it takes a whopping two hours and 24 minutes for it to fully recharge from 0 to 100%. Take a look at how these numbers compare to its rivals right below. Is it even available in Europe? You guys mentioned iP6S battery life but didn't mention its charging time which is way slower.Rename your website to iPhonearena. The Charging Time Of The iPhone 6 Is 3 Minutes More Than The A8. So The 6s Probably Charges A Couple Minutes Faster Than The A8, Since It's Cell Is Smaller Than The iPhone 6. Its Still A Horrible Charging Time For A Cell So Small, Apple Needs To Fix That ASAP And I'm Sure They Will With The iPhone 7. I Don't See How People Can Stand The 6 Plus, It's Charging Time Is God Awfu LOL. He meant the 6s plus, since that was posted for battery life. The 6 plus takes 27 minutes longer to charge. Based on the smaller battery in the 6s plus, that would still be 17 minutes longer. I also recommended the same. In GSMarena review, A8 has Quickcharge 1.0 just like S5. 144 minutes is not bad for 3050 mAh battery. really like the looks of this phone, its just that, its way overpriced..
No way overpriced. you don't buy only the spec. Samsung quality is good. And this one looks premium unlike Samsung previous design. Ok. Now a lot of android fans sometimes harshly label this site iphonearena. And an article like this doesn't help shed that perception. This article contains 2 infographs concerning the battery of the latest smartphones - the first one dusplays the battery life & the second, the charge times. Both parameters are equally important. The latest iphone is included in the first infograph where it performs admirably & is placed near the top of the heap. WHY is it conspicuously omitted from the second which shows the charge times? Where is the uniformity in the article? We all know that for all its admirable qualities, the iphone does take longer than a lot of current gen phones to juice up. Then why not show it? I personally know a couple of guys who base their buying decision mostly on charge times. Why not include the iphone's charge time to let buyers make their own decisions. Same goes for benchmarks. In every single android phone review, we see antutu scores. But they are conspicuously absent in reviews/comparisons involving the iphone. We know that the iphones are perfectly capable of running antutu. If antutu is not important, why include it in android reviews? A benchmark app is either important or not important. Then why run it on one platform & not the other, especially when it is compatible with both? Also when doing the inevitable iphone vs galaxy comparison, please update your geekbench multicore scores. A score of 4400 for a galaxy s6/note is ridiculous. My work colleague owns an s6 & i get to play with it on a daily basis. The lowest geekbench multicore score is 5062 & it ususlly hovers around the 5200 to 5300 range. Its like saying that the iphone 6s has a single core score of 1700,when we all know that a score like that is an anomaly & it usually gets 2400 .
they never loved you man, it's better to just be a troll. tl;dr. Also, they're just trolls so ignore 'em. That design looks gorgeous in my opinion, it's what the S6 should have been; thin bezel and full aluminum body. Hopefully the Galaxy S7 takes this design philosophy. This phone looks impressive. Is this exynos or SD versions? What's the purpose of more sku's such as the A series?